Deepshade are set to release their new album ‘Everything Popular is Wrong’ on 25th September via Ambicon Records. Deepshade will stride forward with their debut album ‘Everything Popular is Wrong’, as the record is a call to arms for anyone who is absorbed by gritty rock akin to Kyuss and Led Zeppelin. Boasting ten colossal tracks, the album has some stellar highlights, from the opening snaring riff attack of ‘Time’, to the Nirvana/QOTSA-esque guile of ‘Lowlights’, through to the infectious angular assault of ‘Sad Sun’. 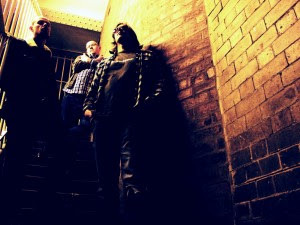 Hailing from Wigan in the North West of England, Deepshade are quickly making new friends with their formidable grungy alternative-rock sound that takes from the fundamental elements of Nirvana, Queens Of The Stone Age, and Alice In Chains, as well as incorporating The Doors and even Beck. Formed in late 2013 by David Rybka (vocals/guitar), Tom Doherty (bass) and Paul Barlow (drums), the eclectic trio aspire to create a genuinely sonic experience that delivers something fresh to the British music scene. With an established loyal following throughout the North, cultivated by a flurry of explosive live shows, Deepshade have also gained airplay support from BBC Introducing and a plethora of alternative radio stations within the UK, EU and USA. With festival appearances and tours in the works, Deepshade are ready to take over. The off-kilter rockers have recently signed to UK label/management ‘Ambicon Music Group’ and earlier this year they released a free debut download single ‘Tattoo’, which garnered accolades from Krank TV and rock media worldwide. The album is available to pre-order as a digital download via iTunes.